Devereux Advanced Behavioral Health Florida’s Child and Adolescent Psychiatric Specialty Hospital, located at the Viera Campus, offers a professional therapeutic environment for children and adolescents facing significant emotional, behavioral and intellectual/developmental challenges. Located in Brevard County, in the town of Viera approximately 45 minutes east of the Orlando International Airport and west of the Melbourne International Airport. Our beautiful 55 acre campus offers a serene setting with tropical landscaping, lakefront views, a swimming pool and playground - all in a climate suitable to enjoy plenty of outdoor activities. The Viera Campus includes a total of six residential units, the Devereux School and a state-of-the-art Activity and Wellness Center. Devereux Florida's Child and Adolescent Psychiatric Specialty Hospital provides services for children and adolescents between the ages of 5 through 17. Our highly experienced multidisciplinary team helps clients diagnosed with affective disorders and psychosis, along with those who have experienced a history of trauma and emotional challenges. The Intellectual and Developmental Disabilities (I/DD) Program provides services for individuals between the ages of 5 to 18. This program provides services for individuals who have the existence of both intellectual/developmental disabilities and mental illness. The efforts of the I/DD Program are aimed at providing the support, training and skills essential in attaining treatment outcomes for individuals who display a wide range of challenging behaviors including aggression, property destruction, severe tantrum behavior, self-injurious behavior, run away problems and difficulty following directions reliably. The individuals admitted to the program display clear deficits in adaptive and social functioning. Treatment focuses on increasing independence in all settings using positive approaches. For over 30 years in Florida, our therapeutic residential programs have been treating children who are victims of sexual abuse, sexual trauma and more recently sexual exploitation. Devereux’s specialty clinical track is based on advanced clinical expertise, evidence based approaches and techniques to help individuals transition from troubled lives to bright futures filled with personal accomplishments and hope. Some of the fundamental keys to successful treatment outcomes are through trauma informed care, a protected living environment that offers a sense of security and treatment strategies that are designed specifically for each individual’s needs. Our multidisciplinary team allows for expert treatment strategies to help each individual identify and process symptoms related to the trauma of sexual exploitation, increase internal insight into emotions associated with the trauma, increase personal coping skills and help develop an individualized wellness recovery action plan. At Devereux Florida, we believe it is important to assist our clients in gaining knowledge and control of their illness to reduce risks of long term physical and psychological complications. The Devereux Florida Viera Campus has earned national recognition for successful treatment with children and adolescents experiencing severe behavioral problems, in combination with diabetic health concerns. Devereux Florida teaches children with diabetes how to manage their illness by offering a diabetes program which uses age appropriate education and training in conjunction with the treatment programming to help stabilize the disease. This is accomplished with individual and group teaching concerning diabetes management, as well as assistance with diet and exercise programs. Recognizing that many youth struggle with co-occurring mental health and substance abuse issues, we offer a substance abuse treatment track designed to meet the unique recovery needs of children and adolescents facing the challenges of substance abuse or dependence. Individual and group treatment programs are available to address issues pertaining to exposure, behavior and addiction. Our treatment model is based on the Positive Behavior Intervention and Supports (PBIS) curriculum, emphasizing the importance of providing individuals with options to make positive choices. PBIS, in addition to Devereux’s unique training methods, provide children and adolescents with opportunities to develop their strengths and learn how to manage their behavior. Multidisciplinary teams led by a psychiatrist, therapist and behavior analyst work in collaboration to support positive change. We believe that through the use of the PBIS methodology, our clinicians and paraprofessional staff will be able to treat children and adolescents more effectively and efficiently while returning them to their communities as soon as possible. Further, we are able to provide children and adolescents with an enhanced skill set, which will improve their coping skills and reduce recidivism rates. At the heart of Devereux’s philosophy is a multidisciplinary approach to treatment, providing patients with extraordinary attention based on their individual diagnosis and medical needs. The term “multidisciplinary” is used frequently today in describing the ideal care for patients. It simply means that a patient can obtain the opinion of a team of medical specialist working together to provide individualized diagnoses, assessments and treatment options. We have multiple specialists in each discipline. A common multidisciplinary team includes behavior analysts, specialized therapists, educators, medical staff (including 24 hour nursing and supervision, two full time on-site psychiatrists, a neuropsychologist as well as a pediatric physician and endocrinologist) and direct care professionals. All strive to provide an integrated approach to teaching, modeling and reinforcing appropriate behavior. 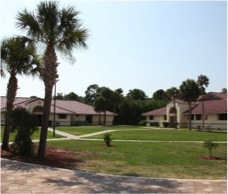 The Viera Campus offers several treatment and support services for our residents. For more information about the Viera Campus, please click here. For additional information or to make a referral, please call the Central Referral Unit at 1-800-DEVEREUX ext. 77130 (1-800-338.3738 ext. 77130) or email referral@devereux.org.